Make great strawberry sundaes with this delicious strawberry sundae recipe! Begin by just spooning a tablespoon (about 15 mL) of whipped cream into the bottom of your serving glass, then add one of the two scoops of strawberry ice cream. After this, cut the strawberries in half and place them in the serving dish, pressed up against it's side. Now spoon all of the remaining whipped cream into the dish and spread it around. Next, add the second scoop of ice cream, then top the sundae with the nice-looking strawberry tip. Finally, drizzle the strawberry syrup over the sundae. And now you have a sundae that looks and tastes like a strawberry sundae should! 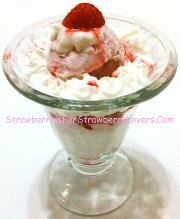 If you want to make your own strawberry ice cream, click here for a nice no-cook recipe from StrawberriesForStrawberryLovers.Com (a new window will open). Or, if you want to make your own strawberry syrup, StrawberriesForStrawberryLovers.Com has a recipe for that, too: just click here (a new window will open for this link as well). When you've finished your strawberry sundae, and you're ready to try another well-made strawberry dish, come back for another recipe from StrawberriesForStrawberryLovers.Com, Home of the World's Happiest Fruit!